Objective: The aim of this study was to develop and validate a short form of the Eating Disorder Examination Questionnaire (EDE-Q) for routine, including session by session, outcome assessment. Method: The current, 28-item version (6.0) of the EDE-Q was completed by 489 individuals aged 18–72 with various eating disorders recruited from three UK specialist eating disorder services. Rasch analysis was carried out on factors identified by means of principal component analysis, which in combination with expert ratings informed the development of an EDE-Q short form. The shortened questionnaire’s reliability, validity and sensitivity was assessed based on online data collected from students of a UK university and volunteers with a history of eating disorders recruited from a national eating disorders charity aged 18–74 (N = 559). 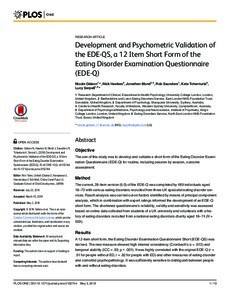 Results: A 12-item short form, the Eating Disorder Examination Questionnaire Short (EDE-QS) was derived. The new measure showed high internal consistency (Cronbach’s α = .913) and temporal stability (ICC = .93; p < .001). It was highly correlated with the original EDE-Q (r = .91 for people without ED; r = .82 for people with ED) and other measures of eating disorder and comorbid psychopathology. It was sufficiently sensitive to distinguish between people with and without eating disorders. Discussion: The EDE-QS is a brief, reliable and valid measure of eating disorder symptom severity that performs similarly to the EDE-Q and that lends itself for the use of sessional outcome monitoring in treatment and research.